Mercedes has broken new ground by revealing an all-electric premium MPV concept. Called the Concept EQV, it features a 100kWh battery to allow for 248 miles of zero-emission driving, with a motor mounted on the front axle developing 201bhp – helping the van get up to speeds of 99mph. Mercedes claims the EQV can get around 60 miles of charge by being connected to a fast charger for just 15 minutes. The concept draws on the designs of both the V-Class MPV and the EQC SUV, which was the German brand’s first all-electric model under the EQ umbrella. That means a large front grille with a unique light signature and chrome inserts, while 19-inch alloy wheels match up with the ‘high-tech silver’ paint finish. Inside, there is space for up to eight seats and, according to Mercedes, as the battery is mounted in the chassis interior space is uncompromised. The cabin comes with a ‘Midnight Blue’ leather finish with rose gold detailing, while blue and black nappa leather is used throughout the interior. As with most recent Mercedes models, the EQV comes with the MBUX infotainment system that includes voice activation and stays up to date with current weather and traffic. 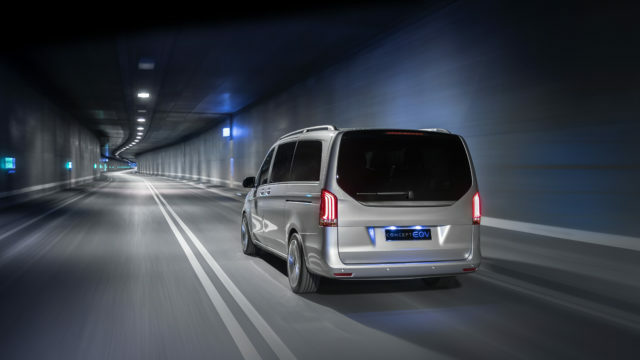 Wilfried Porth, Daimler board member for Mercedes-Benz Vans, said: “The concept offers all of the brand-typical attributes familiar from this segment which Mercedes-Benz customers have come to know, appreciate and also expect. Mercedes says that the EQV will provide inspiration for an all-electric production van that will be shown for the first time at the Frankfurt Autoshow this September.